The black-and-white photograph is striking. At a distance and in its center, a hunting crew carries an umiaq (skin boat) up a shore. Three children run behind it, a lone man stands farther off silently watching, while in the foreground dogs take only scant notice. Beyond that, we can discern nothing. Most of the picture is a blanket of white and it is impossible to determine what is snow, beach, ocean, nearby hills or sky. It all merges into vast emptiness. The emptiness perfectly captures the when and where of the picture. 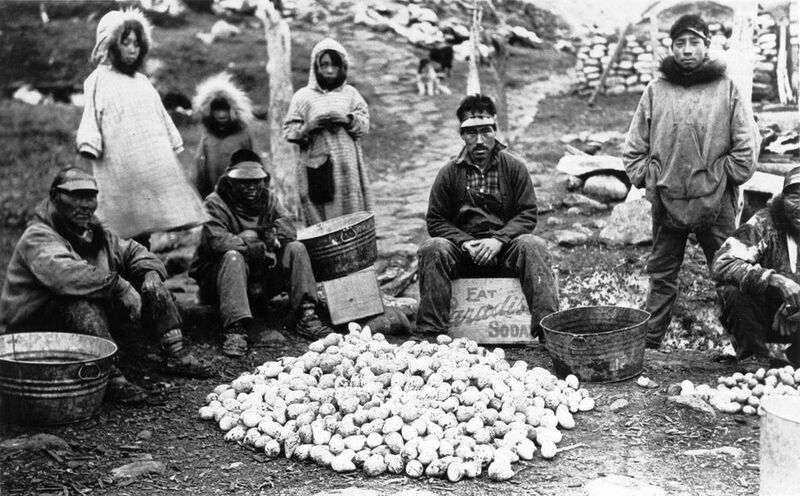 It was taken in the early 20th century on Little Diomede Island, then as now one of the most remote inhabited locations in the United States. The men carrying the boat were Inupiat residents. 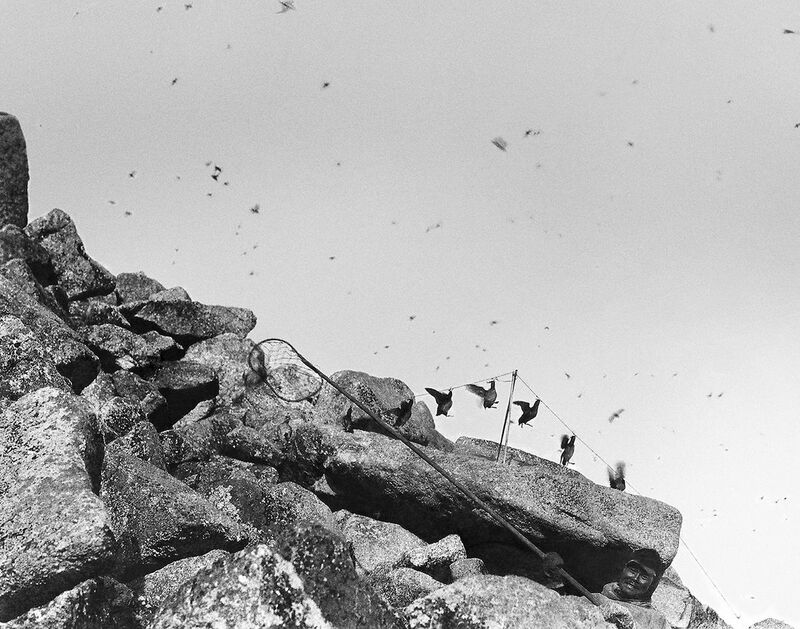 The photographer was a school teacher named Charles Menadelook who spent his professional career working in several western and northwestern Alaska villages, taking his camera with him everywhere, photographing the people and their activities. More than eight decades after his death, the work of this amateur but perceptively skilled photographer has been published in a book bearing his name, "Menadelook." Lovingly assembled by his granddaughter Eileen Norbert, it offers an intimate look at Alaska Native life at the far end of the continent at a time of transition, when traditional subsistence and cultural lifestyles were still predominant but Western ways were rapidly spreading. Charles Menadelook was unusual twice over. Born in the village of Kingigin (Wales) in 1892, he was one of the first Alaska Natives hired as a teacher. As a photographer he was one of the few people documenting Native life at the time who came from within the culture. In an era of deep prejudice against Alaska Natives he took quiet but strong pride in his people and sought to prove to the broader world that they were equal to the white Americans who were slowly filtering into that last corner of the nation's territory. 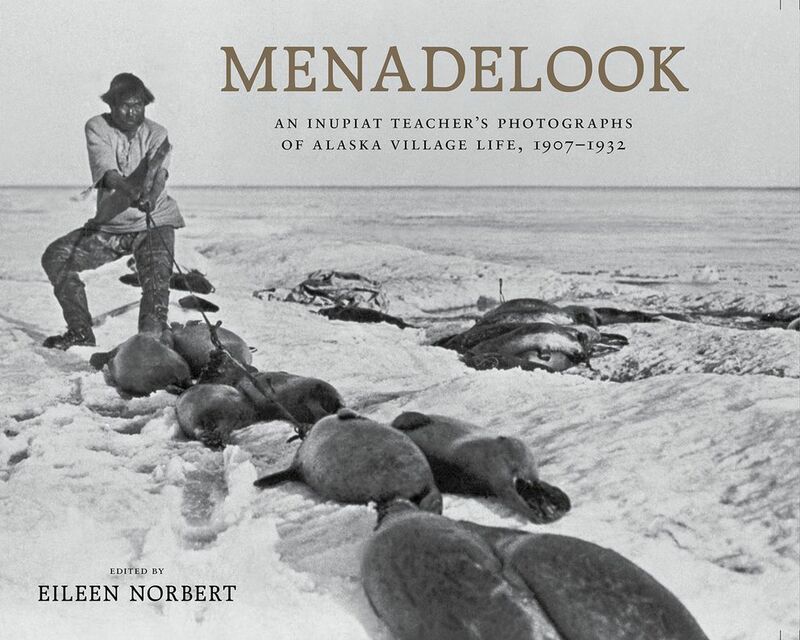 The book gathers nearly 100 of the photographs that Menadelook shot between 1907, when he took his first teaching position on Little Diomede, and 1933, when he died in Nome. In between, he taught in Kotzebue, Noatak, Gambell, Unalaska and Shishmaref. He was regarded as a strict but fair teacher who demanded studiousness from his pupils, but who was sensitive to the importance of the unique hunting and food-gathering seasons for each of the villages, and the importance of allowing his charges to participate in these activities — both for survival and for knowing who they were and the cultures they belonged to. 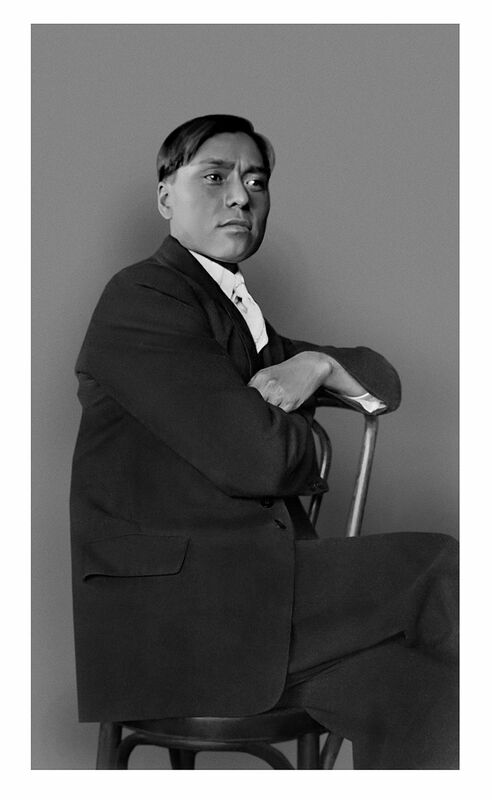 Along with the photos, Norbert provides a biography of Menadelook that explores through his life the complexities of Native life in the era. Drawing off accounts from family members and those who knew him as well as the reports he wrote as a teacher, Norbert is able to reconstruct Menadelook's life with considerable detail, exploring both his childhood and adult years. Menadelook's father was murdered when Menadelook was quite young, and he was raised by his mother and eventually a stepfather when she remarried. His father had been an artist who sketched images of Inupiat life, something that probably kindled Menadelook's later obsession with photography. The time of Menadelook's life was an era when death was a constant presence in that part of Alaska, particularly from epidemics of diseases such as measles and influenza, against which Natives had little immunity. The 1918 flu epidemic is a pivotal event in this book. Menadelook himself was north of the disease's farthest reach, but he lost both his mother and stepfather to it. There was also greater freedom of movement. The Bering Sea was host to a broader culture that spanned both sides. The national borders of the United States and Russia meant nothing to people who had traded with each other for centuries. More than once, both in the text and photographs, Natives from the Siberian side pass through these pages. Norbert notes that Menadelook often traveled to Siberia as well. His observations of conditions on the Russian side, which were harsher than in Alaska, made him patriotic to America, even as he bristled at the unequal treatment his people received. Teachers in Alaska villages of the time had many tasks beyond educating children, including tending to the destitute, keeping village demographic records, providing medical aid (something Menadelook did not enjoy), reporting crimes, giving sermons on Sundays, and even sometimes building the schools they taught in. Where little if any formal government presence existed, they were tasked with filling the void. The story of Menadelook's life is fascinating and well told and would be a worthy book even without the photographs, but to have the pictures as well makes this volume a treasure. Many show sea mammal harvests and the hard physical labor involved. One man in Wales is seen dragging a string of eight seals along a snow-covered beach. Women on Diomede split walrus hides on the large boulders at the edge of the shore. A whale is pulled from the sea with pulleys. 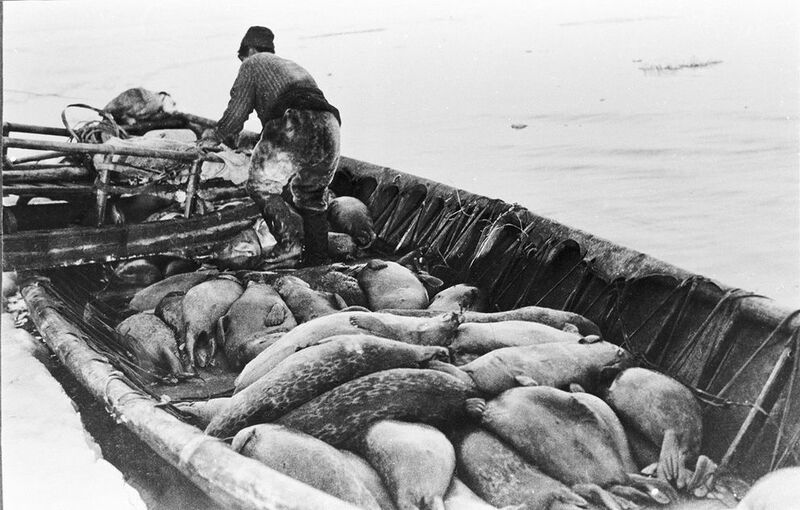 Among other images of working life are an umiaq being loaded, a reindeer roundup and the construction of a sod igloo. In one photo a woman fishing for flounder stands on ice so clear she appears suspended on air. There are also celebratory scenes including a women's tug-of-war on a Fourth of July, a dogsled procession at a winter festival and a row of parka-clad men holding saxophones. Many of the pictures are semi-formal shots of people, where Menadelook's natural affinity for arranging individuals or small groups for a photograph demonstrates a keen eye for composition. Every photo holds the viewer's attention. Much like the Menadelook we meet in these pages, this book is modest on the surface, but its contribution to Alaska is profound. It presents a world that would be completely vanished but for the presence of one man and his camera.